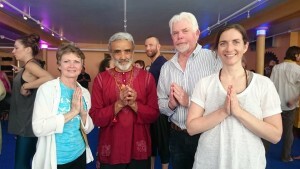 Kathy has practiced yoga for 18 years and is now embracing the teachings of Sri Dharma Mittra with a full heart. She started teaching after completing a Senior Teacher Training at the Shanti Niketan Ashram’s North Carolina School of Yoga under the supervision of Chandra Om, a disciple of Dharma Mittra. Since October of 2014 she has been teaching a chair yoga class at the Love Yoga Shala in Patchogue, Ny. In March of 2015 she completed the Dharma Yoga Life of a Yogi 200 hour immersion. She continues to teach in her community and at the Love Yoga Shala.